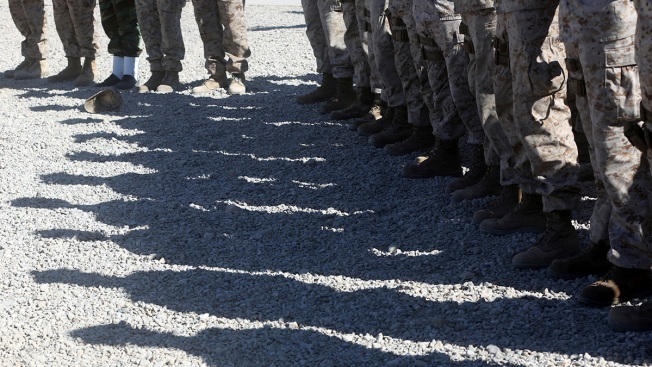 U.S. Marines stand guard during the change of command ceremony at Task Force Southwest military field in Shorab military camp of Helmand province, Afghanistan, Jan. 15, 2018. The Pentagon is developing plans to withdraw up to half of the 14,000 American troops serving in Afghanistan, U.S. officials said Thursday, marking a sharp change in the Trump administration's policy aimed at forcing the Taliban to the peace table after more than 17 years of war. President Donald Trump has long pushed to pull troops out of Afghanistan, considering the war a lost cause. But earlier this year, he was persuaded by Defense Secretary Jim Mattis and others military leaders to keep troops on the ground to pressure the Taliban and battle a stubborn Islamic State insurgency. Officials said the latest White House push for withdrawal was another key factor in Mattis' decision to resign Thursday. The U.S. and NATO formally concluded their combat mission in 2014, but American and allied troops remain, conducting strikes on ISIS and the Taliban and working to train and build the Afghan military.